I was leaving the gym when I checked my messages. Alice Waters' office at Chez Panisse was calling -- yeah, right. Who was this really? When I called back, it turned out Waters was calling and looking for a baker for her charity dinner in Washington, to replace one who had dropped out. Barton Seaver, a friend and chef at Blue Ridge, suggested me. "We hear you make the best baguette in DC," said Sarah Weiner, Waters' assistant. "Well, yeah, I won a contest," I stammered, "but I just bake at home. The most I've baked was for Thanksgiving dinner." They needed to feed 40 -- at a $500 a plate dinner at Bob Woodward's house. Could it be done in my home ovens? I said I'd call back. I went home to figure out how much bread I needed to bake and realized I could probably do it -- 5 big loaves and several baguettes. 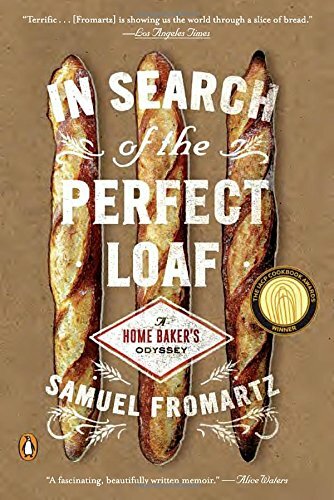 I then called Peter Reinhart -- the renowned baker and author I've known for a couple of years -- to see what he thought. "That's not a lot of bread," he said, and he encouraged me to give it a whirl. So began my first gig as a professional baker -- at an Alice Waters' dinner. I quickly settled on breads I made time and again and eat at home -- a pain au levain made with sourdough and a mix of white, whole wheat and rye flours; a pane casareccio di Genzano, an airy white big loaf crusted with wheat bran that I picked up from Dan Leader's Local Breads; and of course, my baguettes. I've never baked this much bread before, so I worked out a timeline -- and good thing too, since I would need to begin Friday to have the breads ready on Sunday. I started by feeding 50 grams (about a quarter-cup) of sourdough starter Friday morning, building it to 150 grams. On Friday night, I fed it again to take it up to 450 grams. Saturday morning, I refreshed it a third time. 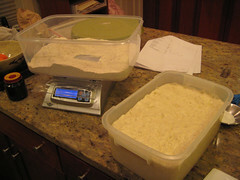 By Saturday evening, when I needed the ripe starter to make my doughs, I had over 1500 grams (3.3 pounds) of the stuff. With that steady feeding every 8-12 hours, the starter was bubbling, itching to impregnate the dough. It's pictured at left, and below, in the big bin on the right. I measured out the flours and began mixing the dough. I don't really knead or use a mixer. Rather, I combine the ingredients by hand until they come together. Then I let the shaggy mass rest so the flour slowly soaks in the water, then fold it over every hour or so to develop the gluten. 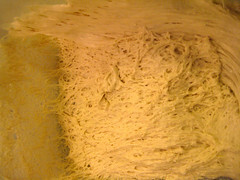 By the end of the process, the dough glistens with moisture. If you pull away a small piece and stretch it, you should be almost able to see through it -- the so-called windowpane test that shows when a dough is done. This folding technique is a cousin to the no-knead method, since you just fold over the dough and let time do its work. It works beautifully, especially since my home mixer couldn't handle the volume of dough I made. Now the magic began -- the first rise, the source of all flavor -- and luckily it was a chilly night. Why was that important? Because I let my sourdoughs rise in an unheated basement storage room that is about 55F. That's the perfect temperature for a languid fermentation, when the sugars in the bread develop. Bakers buy proofing cabinets that cost thousands of dollars to get this temperature with refrigeration. My solution was less precise, but it worked fine. 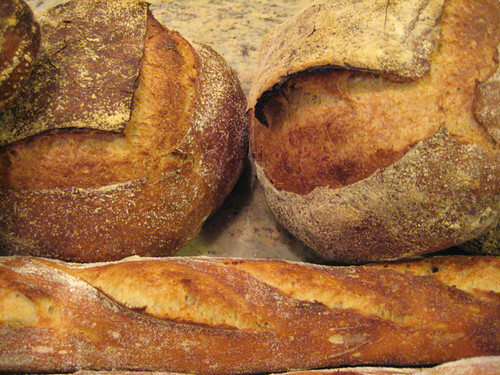 The genzano and baguette doughs rose in the refrigerator, since they contained instant yeast as well as sourdough and I wanted a slower fermentation. At 7 the next morning, I took the pain au levain dough out and let it warm up for about an hour. 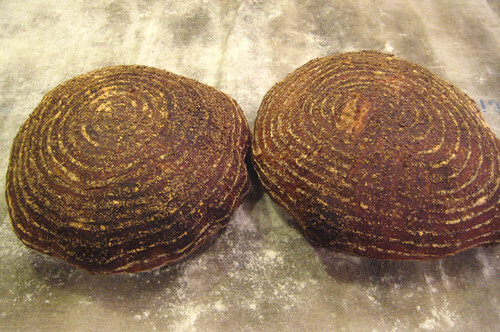 I then shaped three boules, letting them rise for 2-1/2 hours. In the meantime, I heated up the baking stones in my double-oven. Then I repeated this with the Genzano loaf, about an hour later, and then the baguette. The rise went well, full of oven spring. I attribute that to the levain, which you'll recall had built over a 52-hour period with successive refreshments, including the last one in the dough. (Pictured below are the pane casareccio di Genzano - Genzano Country Bread). 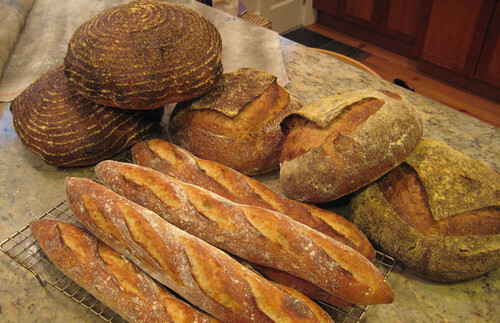 I finished baking at about 2 p.m. and let the breads cool, then delivered the loaves for the dinner. Jean-Pierre Moullé, the chef at Chez Panisse, was there to greet me. We talked briefly about the breads and I mentioned I was a home baker, not a professional. "I know, but you did not bake these at home," he said. "Yes, I did," I countered -- and I noticed his eyebrow rise a bit. Later that evening, at a party preceding the dinner, Alice Waters took me aside, bread lover that she is, and thanked me warmly. It was a nice moment. For a home baker, there's always the moment of anticipation when the bread comes out of the oven and you wait for it to cool before tearing into it. Alas, with these loaves, I didn't get a chance to cut into them, to evaluate the flavor and aromas or assess the interior crumb or the density of the crust -- all crucial to a decent loaf. But I trust they were fine. The thing is, I don't bake for a living. There is no daily pressure, no waking at 1 a.m. to get to the ovens, no staff, no orders. It's just me and the bread. And until yesterday, I've only given my breads away to friends. Now I've donated them for a worthwhile cause. Maybe I've just widened the circle of people who eat my bread. And that's just fine.